Do you have what it takes to be hired? 5. Expertise: However, Google executives have found expertise pales in comparison to the other attributes below. 2. Leadership: At every level and in both small everyday and larger significant ways. To be clear, I don’t want jobs at Google for all, or even most, of our students/children. Google is representative of an innovative company that has successfully navigated the tricky waters of a changing global market and community. There will be many such innovative companies in the near and distant future. This New York Times article, Helping Parents Deal With Learning and Attention Issues, gives an overview of a new ad campaign promoting the website Understood.org. The website is an incredibly useful resource for parents, and by extension educators, as we strive every day to understand children’s experience, make learning and growing accessible and engaging, and walk the balance between protecting our children/students and allowing them the valuable experiences of struggle, failure, and perseverance with an eye towards students who develop both quality intellect and excellent character. Our children and students move through a world that is largely organized, scheduled, structured, and geared towards adults. The website provides a multitude of resources in the areas of: brain research, learning & attention (executive functioning skills), friends & feelings (social emotional skills), and support systems for families. 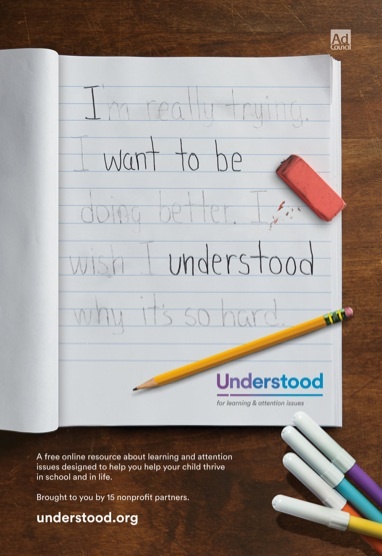 Understood.org seeks to make the experience of different kinds of learners more transparent and accessible for parents and teachers so that we might better support and inspire the next generation.